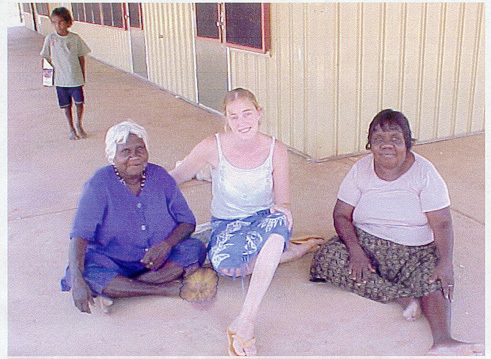 "You must learn, girl, and tell your people"
In September 2002 I arrived in Warmun, a remote Aboriginal community in the East Kimberley. The land consisted of rugged sand and limestone hills, of eucalypt woodlands and spacious savannah grasslands out of which arose enormous boab trees. The climate was dry and hot, over 40 degrees Celsius, but getting more humid towards the wet season that everone was desperately waiting for. I stayed until January... It was a precious time, the elders shared their stories and love for country with me... they taught me about caring and the soul that is in everything. 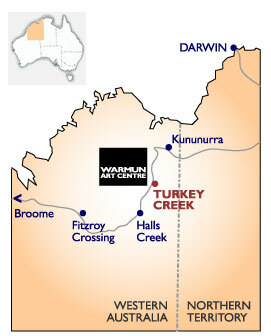 Warmun, also called Turkey Creek, is situated alongside the highway that connects the towns Kununurra and Halls Creek, which are both at a distance of over 200 kilometres from Warmun. 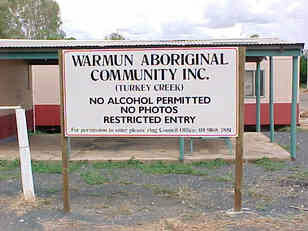 The majority of the Aboriginal people in Warmun is member of the Gija language group. Their ancestors have always lived in this area. Before the arrival of European settlers the Gija lived in close harmony with their land. They had developed a way of life in keeping with the harsh climate and its extremely high temperatures. People knew where to go to find water and food and had extensive knowledge of bush medicines and healing methods. They moved across their land in accordance with the seasons and also planned social gatherings and ceremonials with the state of the seasons in mind. English settlers conquered the area from 1886 onwards, initially searching for gold, later for pastoral lands. Although the Gija, like other Aborigines, attempted to defeat them, they finally had to give in. Many of them were killed in massacres. Those who survived settled on white man's cattle stations, working as stockmen and housemaids. Outside working hours they were able to maintain much of their traditional life, such as hunting for bush food and performing ceremonies. When in 1969 the Whitlam government obliged farmers to pay equal wages to Aboriginal and non-Aboriginal stockmen, farmers did no longer want to maintain Aboriginal labour and forced families to leave. They found shelter at the fringes of Wyndham, Halls Creek and Kununurra, far from their homelands. Due to the initiative of some politically strong Gija members a track of land in Gija country was retained in the mid-1970s. This was Turkey Creek, and the Warmun community was established here. Today the Warmun community counts about 400 inhabitants who live in five distinct ‘camps’ that are based on affiliation with relatives and shared former residence at the stations. Most Gija families have an agreement with station owners to visit their traditional land on a regular basis. The community consists of a school (from pre-primary to year 10), a clinic, administration office, recreation centre, gym, mechanical workshop, community centre, childcare centre, and (since 1998) art centre. 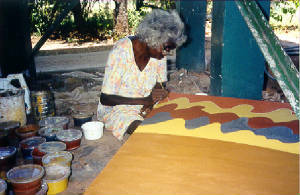 While most institutions, such as the school, clinic and art centre, are managed by Euro-Australians, the community aims to be self-determined and is administered by a community council that mainly consists of elders. I had come to Warmun to conduct anthropological research. But more than anything else I have experienced my time in the field as a personal process of learning. I started as an outsider to Gija culture, often felt terribly white, went through doubts and uncertainties, but while time evolved I mingled in more. When after four months I took the plane to Sydney and found myself at a corner of Eddy Avenue, shaking with the sight of the traffic passing by, I realized how profound living in Warmun had been. I was interested in how art was used to communicate knowledge about identity and spend much time at the local art centre, where I also volunteered. I prepared canvas boards for the artists, wrapped up the paintings that were sold, crushed up ochred they used for their paint, and handed out tea and water. Gradually I learned the social codes needed for interaction. I learned to communicate differently, less direct and abstract, and mixed in some Gija words that I had picked up, which usually caused hilarious laughter. I also noticed the importance of body contact: holding hands, a quick caress, and sometimes a hug. It became common to embrace the older female painters when we met in the morning. Some of the artists liked to hold my hand when I talked with them. Joking was an important part of our relationship. My position amongst the Gija was one of a ‘novice’. ‘You must learn,’ is what people often told me, treating me in the same way as young Gija people. It was out of the question that I could just ask anything, and they expected from me that I was patient. I resigned myself to this, and spent a lot of time just sitting with the artists and waiting until they told me something. There were certain things they liked to talk with me about, and these directed me in my research. They did like to talk with me about their country, its sacredness, their own history in it, as well as that of their ancestors. Some of them took me to their country, which I felt as a great privilege and which was also essential to understand their paintings. Real acceptance came when I was given a skin name, Nambin, which meant that my totem was that of the black-headed snake and that I had responsibilities towards the people I was now related to. Betty Carrington, a wonderful artist with whom I often sat down, became my mother, which strengthened the tie I had already felt with her.